Several options can be explore d for storing pesticides. Store large quantities of pesticides in a building designed specifically for that purpose. Store moderate amounts in their own room or storage cabinet within a building, but not in a basement or other area likely to flood. Make sure the room has a door that opens to the outside. Storage facility construction, or the renovation of an existing building for storing pesticides, requires considerable planning. When choosing a storage site, check on local building, zoning, and fire codes and environmental regulations before construction. 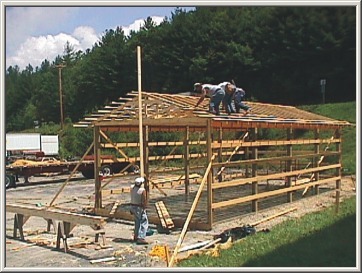 Have the local Fire Marshall or Fire Prevention Inspector review plans for construction. Pesticide Storage & Mixing Facilities. Gary L. Hawkins and Paul E. Sumner. The University of Georgia, Cooperative Extension, Bulletin 1095. Pesticide Storage and Mixing Building. Midwest Plan Service. 5pp. Building Plans and Management Practices for a Permanently-Sited Pesticide Storage Facility in Florida. SM 58. 1997. Thomas Dean and Ray Bucklin. University of Florida Cooperative Extension Service. 45 pp. Order on-line: www.ifasbooks.com (click on ‘Ordering’; ‘Pesticides’; then ‘Exam Study Materials’ and scroll down) or call 1-800-226-1764. Designing Facilities for Pesticide and Fertilizer Containment, MWPS-37. 1995. David W. Kammel, Ronald T. Noyes, Gerald L. Riskowski, and Vernon L. Hofman. MidWest Plan Service, Iowa State University, Ames, IA. 124 pp. Order online. If you are using a portable building for pesticide storage, use secure tie-downs to prevent movement or tipping from strong winds or flooding. To protect the environment, the floor of the storage area should be made of sealed concrete, epoxy-coated metal, glazed ceramic tile or another non-porous material that is free of cracks. This will prevent any spilled pesticides from seeping into the ground and will make cleanup of spills easier. Construct the floor with a continuous 2- to 4-inch lip to keep spills inside the building or the room. Floor drains must be sealed unless they are plumbed to a separate, external, holding tank. Any outflow must be captured and disposed of as hazardous waste. Pesticide storage buildings should be located away from river and stream floodplains, ditches, ponds, and any other likely source of flooding. The site should be downwind and downhill from sensitive areas, such as houses, animal feeding stations or shelters, and food or feed storage facilities. Choose a location that is at least 100 feet from a wellhead and 100 feet from a public water supply. Some states may require a different setback distance (see Laws and Regulations). The best practice is to maintain as great a distance as possible between any potential contaminant and water sources. Ideally, the storage building should be at least 50 feet away from other structures to reduce the risk of fire spreading from one building to another. Choose a site for the storage building that provides easy access for emergency vehicles.